North Fourth Street Historic District. Restores, rents and leases fine historic Victorian homes and apartments in Steubenville, Ohio. Provides historic restoration consulting, problem solving and interior design services to the greater Upper Ohio Valley area. Formed in 1989 with our first restoration project in Wheeling West Virginia, then on to Morgantown, West Virginia and then Hancock, Michigan. Adopted the name of Bayberry Properties in 1995 as we started restoring properties in the Steubenville Ohio historic district. Spring of 2001 Bayberry incorporated as a Limited Liability Corporation under the State of Ohio. If you need business background information from Dunn & Bradstreet our D-U-N-S Number is 086592289. Scott M. Dressel, is owner and the LLC Registered Representative. I take pride in making available rentals with beautiful historic detailing, like hardwood floors and built in cabinetry, along with updated kitchens and baths. Many of the properties are located in the North Fourth Street Historic District, which is on the National Register of Historic Places. The District features a decorative arch marking it's northern entry onto Fourth Street. Plantings of a new variety of Elm along with other types of trees, new historic lighting fixtures and new sidewalks. Owner Scott M. Dressel is active in the restoration of the District, an Attorney with over 20 years of experience in sales, banking product and marketing management, he is also the current Chairman and member of the Steubenville Historic Landmarks Commission and on the Board of the Steubenville Revitalization Group and Historic Fort Steuben. My current largest project is the Restoration of the Grand Theater on South Fourth Street. I have been doing historic preservation and restoration work since 1989. Educated at the University of Minnesota Duluth BA in Business and Political Science, and Law Degree from the University of Minnesota Law School. Understanding the U.S. Department of the Interior’s 10 Guidelines to Historic Restoration and how to easily renovate your project within the restrictions of a designated Historic District. Historically sensitive exterior and interior updating, kitchens, bathrooms and more. Contact us to arrange an appointment or you can also submit your questions by e-mail. More Press Coverage is also found under the Bayberry House Bed and Breakfast page. CHATTING WITH CATHY — Scott Dressel of Bayberry Properties talks to Steubenville City Manager Cathy Davison Monday following a Steubenville Revitalization Group meeting at Froehlich’s Classic Corners. Davison told the SRG members she wants to partner with the group to continue to develop the city’s downtown business district. STEUBENVILLE - Organizers are hoping a tentative May 27 car cruise-in will attract more visitors to the downtown business district and be the start of future Thursday afternoon events. Travis Maxwell of Street Dreams Rod & Custom of Wintersville told 30 members of the Steubenville Revitalization Group Monday that "Newark, Ohio, holds a monthly 'Light the Night' event and attracts 5,000 to 6,000 cars for a one-day event." "They have been doing this for several years now and you should start small. You could set up the cruise-in on Third Street in conjunction with the oldies concert at the amphitheater," said Maxwell. Susan Probert of the economic development committee said the SRG is considering other Thursday events including a pizza pie bake-off. "We want to bring people downtown on Thursdays for the farmers market and then a special event later in the afternoon followed by the concerts at the amphitheater," Probert explained. And the organization heard words of encouragement from City Manager Cathy Davison. "You have a strong history and a bright future. I am pleased to tell you we will be moving city offices into our new city hall facility in May. And we will schedule the demolition of the city annex building on a weekend and will work around the June festivals already scheduled," said Davison. She also asked the SRG members to support the 6.7-mill safety levy on the May 4 ballot. "I feel there is hope and a positive energy in the city, and we will be part of the future plans," remarked Davison. In other business, SRG President Jerry Barilla unveiled a new steel trash container purchased by the organization. "We purchased two of these containers with help from a grant from the Jefferson-Belmont Regional Solid Waste Authority. And with permission from the city manager we would like to have these first two containers installed in front of the new city hall building on South Third Street," said Barilla. "We have plans to purchase additional similar trash containers in the future to be installed in the business district. We are also considering business sponsorship of future containers," he added. Lou Stein of Valley Ventures reported he has brought 13 new businesses to the business district during the past five months, "and 10 buildings are now under development." "We are very excited about that accomplishment. And we are now completing a deal to create loft apartments in the downtown buildings. We want to begin with a model loft apartment to bring people back to residential living in the downtown. We have targeted two buildings to start this project," said Stein. Design Committee Chairman Rob Gribben said he is planning a clean-up day in the business district the week prior to the Dean Martin Festival, which is planned June 18-19. Barilla announced Ray Agresta, owner of Ace Optical on North Fourth Street, has accepted a position on the SRG executive board. STEUBENVILLE - Slowly, and with little fanfare, Scott Dressel is restoring historic homes in the historic North Fourth Street district as well as other homes in the city. The owners of Bayberry Properties is continuing to invest time, labor and financial resources in projects that are literally bringing historic homes back to a grandeur that hasn't been seen in decades. After 13 years, Dressel still believes in the potential of his adopted city. "I grew up in a much different environment in Minnesota in a nice small 150-year-old town located 24 miles outside of Minneapolis. Excelsior is now considered a suburb. Main Street there used to be like Steubenville when it was busy, now it's trendy shops, restaurants, coffee shops. People there say 'Remember when' but they are also enjoying Main Street today," related Dressel. "During the past 13 years I have spent the vast majority of my time working on the North Fourth Street historic district. Remember when the houses there were open and abandoned. They aren't now, and homes are selling well over $100,000 when fully restored. North Fifth and North Sixth streets will be cleaned up as well," said Dressel. "Having lived in many parts of this county in other similar historic areas, I see the potential to make Historic downtown Steubenville into something special and unique. Downtown has the most unique architecture in town. It's the historic center of Jefferson County - the starting point of the state of Ohio, and the rest of the United States to the west of here, which began here with the surveying of the Northwest Territories and creation of the Northwest Ordinance. How much of what we take for granted in this country began because of what started from Fort Steuben. Why would we ever want that history to die or be ignored? It should be celebrated and our children should know it well. What would the great founders and business leaders say if they saw how downtown has declined," asked Dressel. "Every part of the city is important to our future, and downtown is what makes Steubenville unique. If we want downtown to be better, we have to want it to be better, and we have to start thinking that it can be better to make it happen. If we want it to decline we can continue to not go there, to think it's bad and to not allow your children to have happy memories of downtown. Historic downtown Steubenville is actually pretty cool so I urge everyone to remember the past, but don't be trapped by it, and embrace a new cooler future," said Dressel. "I remember when the Weir-Millsop home was wide open and a mess. I walked in to look around and no one cared that I was checking out the house," Dressel recalled. Dressel purchased the former home to the heirs of the Weirton Steel Co. and has performed preliminary exterior repairs. "The house next door was covered with vines and was nearly hidden from view. I was able to buy the vine covered house and also the red house on the other corner because it had already been condemned," Dressel explained. "The house on North Fourth Street, that was once nearly hidden by foliage and vines, underwent a major makeover and is now listed for sale. "This house is probably 137 years old. The cedar lining came from the house next door. Francis Millsop used to store her furs in the cedar closets. I took them out, slid them out the window and down a ladder and brought them over here. These closets have that cedar smell in them now," Dressel pointed out. "People who know me say I am much happier than I used to be. I like what I am doing. I know restoring these houses can make a difference to the community," Dressel declared. "I really believe the downtown residential area makes Steubenville unique. These are truly historic homes with stories about each house. The downtown is what makes Steubenville different from other communities," Dressel stated. He added he is starting to see a renewed interest from people wanting to buy or rent a home in the North End. "This is the living history of Steubenville, it needs to be protected, saved, treasured and enjoyed," added Dressel. He noted Bayberry Properties is now offering general building contracting and restoration services. STEUBENVILLE - An ad hoc group representing private interests and government entities continued to discuss ways to reduce crime in the city's two hilltop neighborhoods Thursday. But the work to create a working partnership was not without growing pains during the meeting. "This is the first time we have had good dialog like this. We have to do something to raise standards and bring people to this community," urged Rick Yanch of the Hilltop Community Development Corp.
"All we are trying to do is clean our town up. We need to stop pointing fingers and work together. During the 1970s the federal government told us there could not be any more public housing complexes downtown. That's when the public housing was also built throughout the town. We need to do something about the concentration of rental voucher housing on Pleasant Heights and LaBelle," said 1st Ward Councilman Gerald DiLoreto. The proposed disbursement of Section 8 housing was the main topic of debate and discussion during the 90-minute meeting. "One of the main reasons we are here is to see if something can be done to disperse the Section 8 housing. Perhaps tenants can be told of other rental housing available elsewhere in the city or other communities," said Ed Quinn, president of the hilltop organization. According to local landlord Scott Dressel, "the problem isn't Section 8 housing. This market has very low rental rates based on assessments by the U.S. Department of Housing and Urban Development. We have a problem because of low rental rates in our area. "If you can statistically prove there is more crime in Section 8 housing, then I am in full agreement with you. But most people receiving rental vouchers are good people," added Dressel. Joe Costantini, executive director of the Jefferson Metropolitan Housing Authority, agreed with Dressel and noted "the fair housing rental rates are not high enough for someone or a family to go out and rent in the suburbs. The rates set by HUD are targeted for the Steubenville and Weirton market. "And we must remember one common factor is a weak economy. That is always going to be an issue we have to deal with," Costantini said. Teresa DiCarlontonio of the hilltop group said residents living in the Pleasant Heights and LaBelle neighborhoods are concerned because of the increase of crime there. "Crime has moved from the downtown area to the hilltops. We have a problem. We live there. We would like to see tenant screening tightened up," stated DiCarlontonio. "Tenant screening is pretty much the same for Section 8 housing as for public housing. We do our background checks through the state of Ohio data base," replied Costantini. "We are going to have to focus on lease violations or violations by a landlord. Are the tenants considered a nuisance, is there loud noise, have they committed a lease violation of some sort, are their kids outside running around at 1 a.m.? We have to be able to build a chain of issues back to a tenant or a house," explained Costantini. "You have the nucleus to attack the problems you have described here. But you have to do it legally. The person who qualifies for assistance has the right to rent a house wherever they can. If the person who rents the house is following the rules, there isn't an issue. But if the person is dealing drugs you already have a mechanism in place with the police and countywide drug task force," advised Jim Mavromatis, a law enforcement consultant for the city. "You can't stop property owners from renting their houses as long as the property meets city codes," added Mavromatis. DiCarlontonio called for all parties to "put together a program that will include the housing authority and landlords to work together on more strict background checks." "Maybe we can list the problem areas and start putting pressure on those landlords. Maybe the landlords' association can discuss the issue with the property owner and set recommended standards for rental housing," said Dressel. Hilltop group member Barb Wilinski said she thought the ad hoc committee has made progress in the past two months. "We need to start holding confidential discussions and begin listing and looking at the problem houses," suggested Wilinski. STEUBENVILLE — Scott Dressel has been writing and polishing his speech for the past 12 years. That’s how long the Minnesota native has been living and restoring homes on the Historic North End of Steubenville. Dressel used Tuesday’s presentation to the Kiwanis Club to preach the merits of saving the downtown neighborhoods while encouraging the Kiwanians to get involved in the community. “I don’t have the ‘remember when’ of the past retail and residential history. In fact, all I see is potential for a great future. I remember moving here and the downtown was looking totally abandoned. There are now improvements popping up all over downtown,” Dressel said during the meeting at the YWCA. “I see the potential to make historic downtown Steubenville into something special and unique. The downtown are has the most unique architecture in town. It’s the historic center of Jefferson County,” added Dressel. “One question I keep asking myself is why everyone seems so content with not creating a similar nostalgia of downtown for their own children, most of who have grown up either being afraid of downtown Steubenville or never going there at all,” Dressel said. “Every part of the city is important to our future and the downtown is what makes Steubenville unique. Historic Downtown Steubenville is actually pretty cool,” Dressel said. Dressel said he grew up in a small town in Minnesota. “I finished law school in 1989 and was visiting friends in Wheeling and became very interested in what they were doing in that community. I moved to Morgantown and then Michigan where I lost my job and moved in with friends in Follansbee. I came over to Steubenville and saw the old Millsop house on Fourth Street and just walked in and looked around. But no one cared so I looked at the house and knew it had potential,” recalled Dressel. Dressel bought that house as well as several other downtown houses and he embarked on a 12-year restoration campaign. “When I bought that first house, I knew I could renovate it and make a difference. The renovation work that has taken place in the north end of the city and the $800,000 investment by the city to create the Historic North End district has probably resulted in an overall $10 million investment in that neighborhood,” declared Dressel. “I still want to renovate the old Millsop house into a bed and breakfast but we have to secure the funding for the work first,” Dressel explained. “I spend time at the Ville Restaurant at the Fort Steuben Mall because I like the food and have a lot of friends there. And about once every couple of weeks I end up giving my 20 minute lecture about the good things downtown,” related Dressel. “Join those of us trying to make it better and provide your children happy memories and a place to bring their children for unique events, gifts, shopping and dining. Working together we can have a better future for the entire city,” Dressel stated. STEUBENVILLE — Scott Dressel believes in the downtown neighborhoods of his adopted city. Dressel owner of Bayberry Properties, believes so much in the downtown area that he has been investing his time, physical labor and financial resources into restoring several historic homes in the Historic North Fourth Street district as well as other homes in the city. It all started in 1996 when Dressel returned to the Ohio Valley area. “I had lost my job in Michigan and had returned to the area to stay with friends in Follansbee. I heard there were some older homes here for sale so I drove over to look at them,” Dressel recalled. “The Weir-Millsop home was wide open and a mess. I walked in to look around and no one cared that I was checking out the house,” Dressel recalled. Dressel purchased the former home to the heirs of the Weirton Steel Co. and has performed minor exterior repairs. “The house next door was covered with vines and was nearly hidden from view. I was able to buy the vine covered house and also the red house on the other corner because it had already been condemned,” Dressel explained. “The house on North Fourth Street, that was once nearly hidden by foliage and vines, under went a major makeover and is now listed for sale. “This house is probably 137 years old. The cedar lining came from the house next door. Francis Millsop used to store her furs in the cedar closets. I took them out, slid them out the window and down a ladder and brought them over here. These closets have that cedar smell in them now,” Dressel pointed out. He has come a long way from his career in the banking industry, but he said he is happier doing the manual and often dirty work of restoring houses. “People who know me say I am much happier than I used to be. I like what I am doing. I know restoring these houses can make a difference to the community,” Dressel declared. “I really believe the downtown residential area makes Steubenville unique. These are truly historic homes with stories about each house. The downtown is what makes Steubenville different from other communities,” Dressel stated. Dressel said he is starting to see a renewed interest from people wanting to buy or rent a home in the North End. And that interest has encouraged Dressel to take a very active interest in downtown Steubenville. “Historic Downtown Steubenville is like a city within a city, not at the expense of any other part of the city or any other development, but we want to preserve and maintain the historic character of downtown for a better future with upscale housing, loft apartments, coffee shops, unique shops and boutiques. Things you can’t find elsewhere. At the same time, it can serve as the location of our city and county government office buildings,” Dressel stated. “This is the living history of Steubenville, it needs to be protected, saved, treasured and enjoyed,” added Dressel. He said many of the city’s downtown buildings are rich in history and historical detail. “I was looking at a Market Street building that had a drop ceiling. So I climbed up above that to look at the structure and found a beautiful detailed plaster ceiling that is still hidden away today. The architectural details in some of the downtown buildings are amazing,” Dressel noted. “There are hidden stairways in the building and marble detail work that won’t be found in a new building,” he added. Dressel said he is encouraged to see people moving into the North End and reclaiming the older houses. He said members of the Steubenville Revitalization group should be commended for their efforts to attract new residents and businesses to the downtown location. “The downtown area is what makes this city unique. It is a part of our area’s history that we should all recognize and work together to preserve,” Dressel noted. He said Bayberry Properties is now offering general building contracting and restoration services. 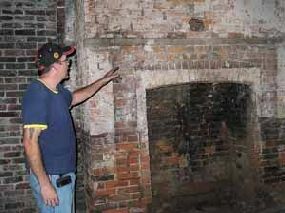 THIS OLD HOUSE — Scott Dressel points to a cooking fire place hearth in a house he believes dates back to at least the 1840s. Dressel said the back rooms of the house where the original home and the front part of the house was probably added in the 1860s. STEUBENVILLE — Fourth Ward Councilman Dave Fortunato is a big fan of Scott Dressel and Bayberry Properties. “Since Scott started buying houses on North Fourth Street in 1996, he has turned this neighborhood around,” Fortunato stated. “I wish him good health because he works so hard with his crew to reclaim these houses and turn them around in such a beautiful way. I hope he is here for a very long time,” said Fortunato. Dressel, a lawyer turned banker and now a restorer of historic houses in Steubenville has been quietly and without a lot of notice restoring several homes in the north end historic district. “The Weir-Millsop home was wide open and a mess. I walked in to look around and no one cared that I was checking out the house. The house next door was covered with vines and was nearly hidden from view. I was able to buy the vine covered house and also the red house on the other corner because it had already been condemned,” Dressel explained. The house that was once nearly hidden by foliage and vines is now in the final days of a major make over and is listed for sale. “This house is probably 137 years old. I’ll probably end up replacing these steps in front but they are the original slate steps. You don’t find them like this any longer,” said Dressel. A tour inside the historic home revealed pocket doors, restored fireplaces and cedar line closets in the bathroom. “The cedar lining came from the house next door. Francis Millsop used to store her furs in the cedar closets. I took them out, slid them out the window and down a ladder and brought them over here. These closets have that cedar smell in them now,” Dressel pointed out. Dressel has come a long way from his career in the banking industry, but he said he is happier doing the manual, and often dirty, work of restoring houses. “The people from out of town are more interested in these homes. I have talked to local people who say they haven’t been downtown for two years. And I tell them I live downtown and I feel safe here. Every city has its problems, and Steubenville isn’t any different, but the downtown area is quiet at night,” said Dressel. According to Dressel, a good house will attract good tenants and sometimes bad tenants. “But a bad house will only attract bad tenants. That’s why I have background checks conducted on all my tenants in my rental properties downtown and on LaBelle. I want good tenants in my properties,” Dressel said. As he walked from the nearly completed house for sale, he stopped in front of the Weir-Millsop home at the corner of North Fourth Street and Madison Avenue. “This house was built probably in the 1850s or 1860s. I believe there were three owners before David Weir married Francis Millsop and they moved in here in the 1930s. They did some major remodeling, put in new bathrooms and other renovation work. She moved out in the early 1960s and the house started going down hill. But it is a solid structure and we are going to bring it back,” declared Dressel. Taking interior walls down to the bare wooden studs is a time-consuming project that has sometimes rewarded Dressel with bits of past history. “We will find the tradesmen signatures on the walls. And for some reason newspapers from the World War II era were very popular for putting inside the walls,” said Dressel. “But what I have found the most are needles, thimbles, thread and buttons hidden inside the walls. The only thing I can think of is mice liked shiny objects and carried those items to hide in the walls,” Dressel said. Other items found in the older homes on North Fourth Street include old license plates, an 1893 silver dollar and trash punch cards. “It looks like the residents would have these cards punched when their trash was picked up. And they were just forgotten at some point and left behind,” Dressel remarked.He noted his adopted city has a number of treasures in the downtown area. “I was looking at a Market Street building that had a drop ceiling, so I climbed up above that to look at the structure and found a beautiful detailed plaster ceiling that is still hidden away today. The architectural details in some of the downtown buildings are amazing,” declared Dressel. “There are hidden stairways in the building and marble detail work that won’t be found in a new building,” he noted. “I am currently finishing up on the one house and ready to start serious work on the red house. Normally I just try to do one house at a time but the opportunity was there so we started doing two houses at once,” explained Dressel. He said what he initially thought was an old addition to his red house on North Fourth Street was actually the original much smaller home. “We started taking off the plaster and extra brick work in this back room and discovered a cooking fire hearth that probably dates back to the 1840s. There is a similar fireplace upstairs and one in the basement. This was the original house and someone added the rest later on, maybe 20 years later,” Dressel said. “You can just imagine when someone was using this hearth to cook food in this house with a pot hanging over the fire,” Dressel added. His red house is still in the demolition stage although he has a Jacuzzi bath tub ready for a future bathroom. “I walk into a house like this and I see it completed. I see what it will look like when we have everything rebuilt, painted and completed,” Dressel stated. “I have my eye on several more properties on North Fourth Street. I have made an offer but haven’t heard anything back yet. But if they don’t work out, I’m looking at Fifth Street and also Sixth Street. There is a lot of potential in the north end,” declared Dressel. It is a sentiment echoed by Fortunato. “The north end is coming alive again. And we can thank Scott Dressel for all his work. He is single-handedly turning the north end around,” Fortunato said. RESTORING THE NORTH END  Scott Dressel of Bayberry Properties stands outside his latest project  the restoration of 428 Clinton St. in downtown Steubenville, converting a mid-1800s duplex into four modern luxury apartments with all the amenities. STEUBENVILLE - Bayberry Properties is bringing back the residential character of the North End and parts of LaBelle View one house at a time. Scott Dressel, owner of Bayberry, specialize in offering fine residential and commercial rentals; rental apartments, homes and garages; as well as historic architectural preservation of Victorian- era property. Bayberry has quietly gone about its work for several years, and the difference its work has made is visible. Currently, Dressel is working hard to complete the conversion of a mid-1850s duplex at 428 Clinton St. into four modern one-bedroom luxury apartments, complete with fully equipped kitchens and laundry facilities as well as all-new bathrooms and heating and air conditioning units. One of the apartments has a small office room in it. The building's interior was gutted by Dressel, down to the bare walls. New wiring, plumbing and lighting, new drywall and carpet, as well as kitchen and bath fixtures have been installed. One apartment is being maintained with its original hardwood floors. Three apartments have access to a patio or porch or a deck. Leases are $400 to $450 a month, plus utilities. Some city residents might balk at such an investment, but Dressel says he's not in it to get rich but to restore the homes and the neighborhoods. "People don't know about the best-kept secret in Steubenville," he said. Dressel said those he's sold homes to or others who are restoring homes in the North End share the feeling. "People do not understand. It's quiet. There's no traffic, no crime," he said. Dressel grew up in Minnesota and came to the area in 1989, getting involved in the restoration of several properties in Wheeling. He moved to Steubenville in 1995 and began buying properties, eventually becoming a member, and now chairman, of the Steubenville Historic Landmarks Commission. 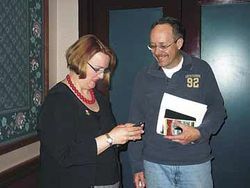 He was involved in the North End Streetscape planning with retired urban projects director Virginia Kopras and current director Chris Petrossi, himself a North Fourth Street resident. Dressel had lived on Belleview Boulevard but now he and his family live at 506 N. Fourth St., where the old blacksmith shop behind the home has been cleaned up also. Dressel had worked at PNC Bank in Pittsburgh for 10 years, but he's quit that job to concentrate full-time on the rental properties and home restorations. He says he knows he's not going to get rich, but, "It's worth doing. The history needs to be taken care of." He said that Steubenville is the first place heading to the nation's interior from the East Coast that affordable Victorian properties that are restorable can be found. He said there are a few Queen Anne Victorians available in the North End for between $20,000 and $60,000 that can be made into expensive homes for an investment in restoration of about $150,000 or so. "Homes like this in Pittsburgh are ridiculous" in cost, he said. "People do not understand the benefits of these homes." In addition to having a true mansion instead of a more modern McMansion, Dressel said the location in the North End is good, with a quick walk downtown or a few minutes to drive to the Hollywood Plaza or the Fort Steuben Mall. He said fine dining is a few blocks away at Froehlich's Classic Corner at Fifth and Washington streets. He said there are plans in the works for a coffee shop on Market Street and a new bakery in the Fort Steuben Hotel building. He said the goal is to preserve heritage. "We too easily throw away what is old," he said. "But if it wasn't for this area being here, Steubenville would look like everywhere else. It would just be suburban sprawl, similar to every other place that has shopping centers and malls. "This is only here," he said of the architectural character of the North End and the hilltop neighborhoods. Who wants to live in these homes? People from everywhere, he said. There are couples from New Jersey and California who have bought or rented properties as well as people from Maryland or Pittsburgh. The people have jobs in Pittsburgh or Wheeling or Newell or other areas around the Tri-State Area, he said. The renters and buyers tend to be young professionals and families, he said. Bayberry takes care to avoid the pitfalls of renting properties to people who will not take pride in their residences. First, Bayberry conducts background checks and will not accept tenants with recent criminal records or those who have ties to narcotics dealing. Second, Bayberry's screening requires the tenant to have a verifiable source of income. And the care and quality in restoration and rental shows, Dressel said. During the past year, with investment from his company and others, both local and from out of the area, as well as the work of the Journeys of Service Helping Upper Appalachia program, many properties along North Fifth Street have been repaired, cleaned and painted, he said. The 428 Clinton St. property, he said as workmen installed carpeting in the upstairs apartments, was built in the 1850s, with additions in the 1870s, the 1890s and the 1920s. He has remodeled and restored and modernized to provide apartments with the usual modern luxury amenities. Each apartment has its own individual high-efficiency furnace and air conditioner. The basement has been cleaned and repaired and is home to individual washer and dryer units for each apartment. The kitchens will have refrigerators, stoves and dishwashers in addition to modern cabinetry. He said tenants often need to learn that the landlord needs to earn a rent that pays for the mortgage, the insurance and the upkeep and maintenance of the property. It's not often a good sign to pay a very low rent. He inspects his properties once a months for the first six months after renting them to a tenant, and then once a year thereafter if no problems are found. "Tenants should understand that it's better to pay enough and to be responsible enough, to keep the property clean," he said. For many renters, it's not just a case of naturally knowing what to do. He said social service agencies and public housing providers could do a better job with tenants to educate them about what it takes to maintain a residence. He also recommended that social service agencies that provide food to people in need should provide laundry soap and home cleaning supplies and personal hygiene products. He said tenants and renters in the city have gotten a bad name, as well as some landlords when the issue of property maintenance can be easy to take care of. As he finishes 428 Clinton, with one unit already rented, he's already making plans for this year's major project: The remodeling of the interior of 741 N. Fourth St. Bayberry has owned the property for several years and the exterior has been repaired, but the interior work has been on hold. Bayberry also owns properties on LaBelle View and four on Pleasant Heights, he said. For information about restorations and properties for sale or rent from Bayberry, visit www.bayberryproperties.com on the Internet or call (740) 284-0027. The Web site also includes a number of historic property resources and links, as well as information and a timeline about properties Bayberry has restored in the region and a link to Dunn & Bradstreet information about the company.